Remember how you were forced to use the two step verification option or to allow access for “Less secure apps” while setting up eM Client with your Gmail account? 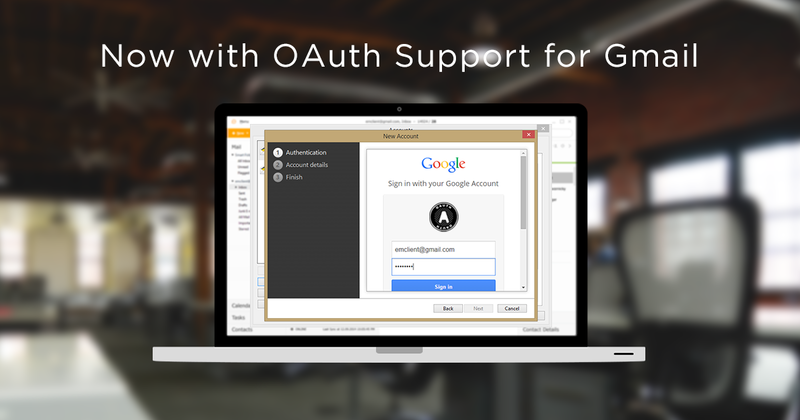 As of today you can update your eM Client to the latest release which from now on supports the OAuth authentication method that will allow you to authenticate with your Google account without any prior account adjustments and will increase the security of your account. OAuth is the authentication standard that allows applications to reach out to your server for an authentication “Token”, that will be serving as the access key between your mail server and the application. This feature also allows you to manage the connected devices remotely, just by logging into your account settings online. Since Google has decided to shut down support for the less secure apps, on April 30th make sure to update your application soon to avoid any future authentication issues. Download the update here or by using the "Check for Update" option under Help in your eM Client installation.